You’ll hear a lot of noise from people who say that today’s parents are too protective of their kids, and maybe that’s true – but it’s probably just because the parents of yesteryear didn’t seem to ever give a thought to their kids’ welfare. That is, if these “toys” from the first part of the 20th century are accurate depictions of how concerned parents were with safety. 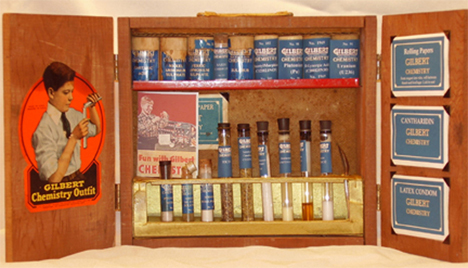 These three vintage toys were all produced by the Gilbert Company, the very same “toy” maker who gave the world the astonishingly dangerous Atomic Energy Lab. 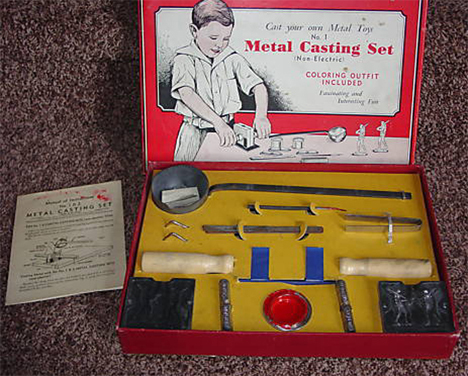 The Metal Casting Set gave boys (it was a hundred years ago – girls weren’t really expected to be interested in toys that didn’t involve cooking or cleaning) the ability to melt down lead and play with actual molten metal. 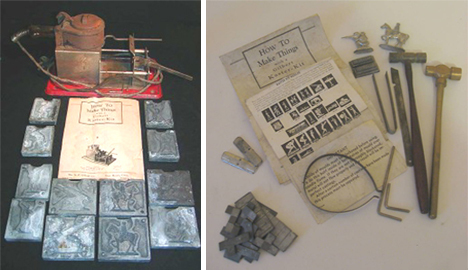 The kit came with a melting pot, molds to make little metal figures, and lots of metal for small children to melt in their own homes. Despite the obvious and almost unbelievable level of danger represented with this toy, it might have been kind of fun to live in an era when this sort of things was allowed to exist. 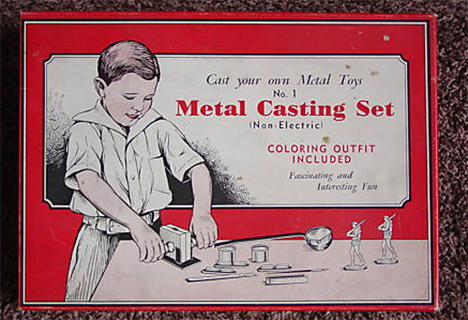 The company produced over 50 molds that you could buy as accessories to the casting set, letting you produce an entire metal figuring army complete with weapons and ships. 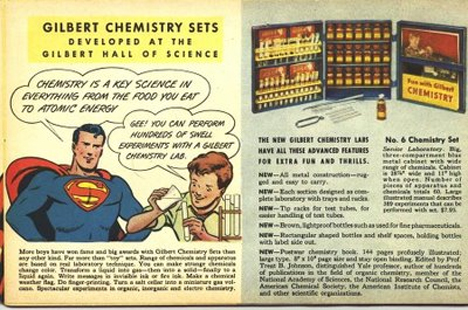 Doing chemistry experiments at home might actually have led to a generation of great scientific minds. 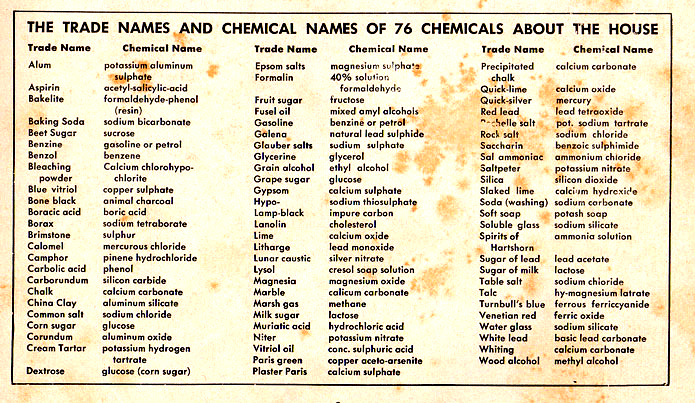 But having a set of chemicals like this in your home today would pretty much guarantee you’d be arrested and put on the NSA’s watch list. This is far and away our favorite. Sit a kid down with some glass, a tube, and an open flame and just let him go ahead and make something awesome. Setting aside the potential for permanent scarring, blinding, and just overall long-lasting suffering, it would genuinely have been fun to have a set like this as a kid. 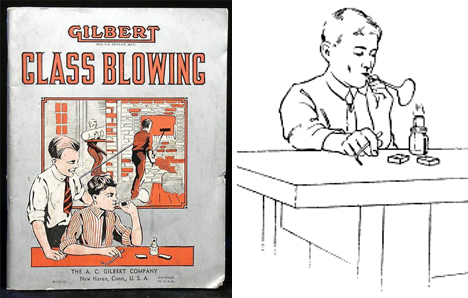 The glassblowing set, and indeed all of the Gilbert science kits, taught the fundamentals of science along with letting kids do quite dangerous experiments on their own. Maybe it was this blind trust that instilled a sense of responsibility in past generations of kids. 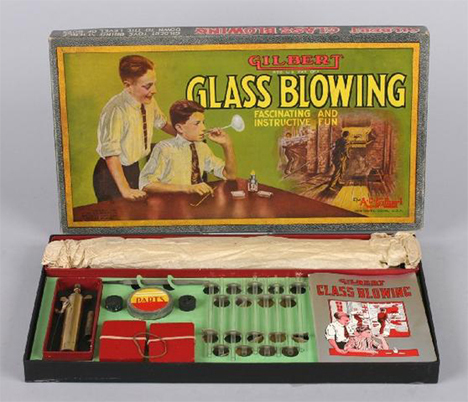 Or maybe those scarred-for-life kids grew up to make laws that prevented other kids from playing with molten lead, hydrochloric acid, and melted glass. See more in Antique Gadgets or under Vintage & Retro. August, 2014.